Keep your dog on a short leash with our traffic leads. Lead handle measures 6", therefor it works for dogs that stand 2 feet or taller. Flat nylon or Polyester is the most common material used because it has a nice shine to its color, and a smooth feel that is not harsh on your hands. The standard hardware for the traffic lead is a metal bolt snap, however we offer trigger snaps, beefy snaps, and the panic snap (see options above). This lead is 6" inside diameter, and over all length is 11" from top of handle to end of hardware (*note this is for the bolt snap and other hardware will have a different overall length). Fashionable, durable, and secured pet leash. 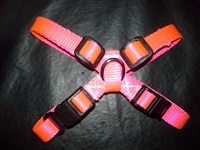 Heavy duty stitched with your choice of snap that is great for all pets as it is less likely to come "unclipped"
Specifically made with 2 plastic side release buckles so the pig does not need to "step into" the harness and designed in an "X" so that it wraps from over one shoulder to under the belly to the opposite shoulder to prevent choking the animal. Key Fob made with a split O-Ring and Nylon Webbing. Keep in mind each letter/number is approx 3/4" wide.